A wrinkled ibu sells traditional sate to a group of teenagers taking selfies on their smart phones. A young woman leaves the traditional market, her bags full of batik, and crosses the street to one of the city’s several malls to finish her shopping. A horse-drawn cart, its bells twinkling, gives way to a sepeda motor, as young boys in ripped jeans and tee shirts carry wayang kulit (shadow puppets) into a building to prepare for that night’s performance. Yogyakarta (sometimes spelled Jogjakarta) is often referred to as the center of Javanese culture, and it is a city rich in traditions and history. At the same time, it is a growing, modern university city. This dichotomy can be seen everywhere, and it was a constant source of interest for me during my recent, too-brief visit. 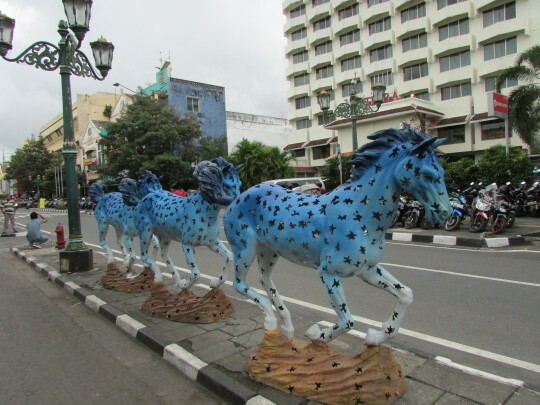 Yogya, as the city is often fondly called, has a remarkable history. 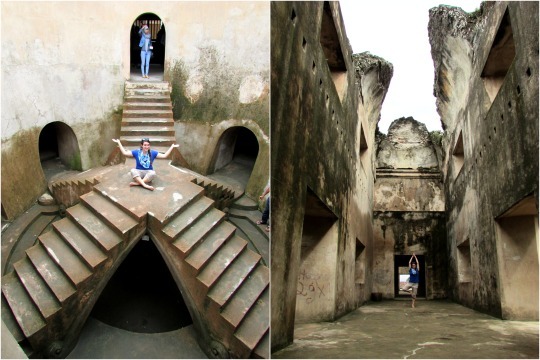 There were once many kingdoms which dotted the landscape of Java, but the only place which still clings to some remnants of that era is Yogyakarta. During Dutch colonialism, the sultan refused to submit to the invaders, choosing instead to lock himself within the compound of his kratan (palace). The Dutch dared not touch him, as the Javanese in the area looked to him almost as a god, and this allowed Yogyakarta to become an important place of refuge for Indonesia rebels during their fight for independence from the Netherlands. In fact, it even acted as a temporary capital for the nation throughout the struggle, from 1946 until 1948. Even though it is no longer the capital, kota (city) Yogyakarta and the surrounding areas have become a special provinsi (province), and they are still, in some ways, ruled by their sultan. I was only in Yogyakarta for a few days, and as I also took advantage of my time there to visit the nearby temples of Borobudur and Prambanan (to which I will be dedicating an entire blog), I was not able to explore all of the historical sites for which the city is so famous. I did do a fair amount of wandering up and down Jalan Malioboro, which is the center of the tourist section of town. 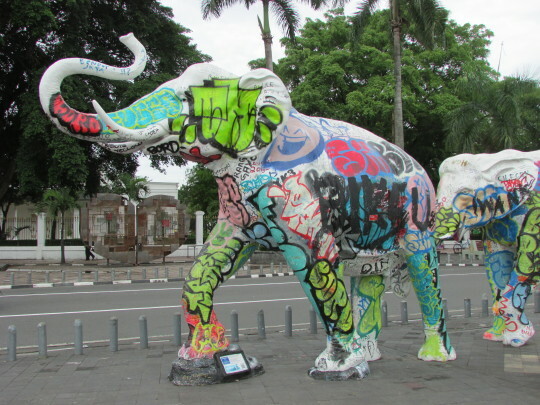 I admired the sculptures that were in abundance along the sidewalks; I was overwhelmed by the crowds in Pasar Beringharjo; and I stood outside of the gates of the kraton itself, though I did not enter the actual complex. It was the sort of fly-by tourism I generally do not enjoy, but I made the most of the time I had. An historical site I actually did spend some time exploring was the Water Palace. 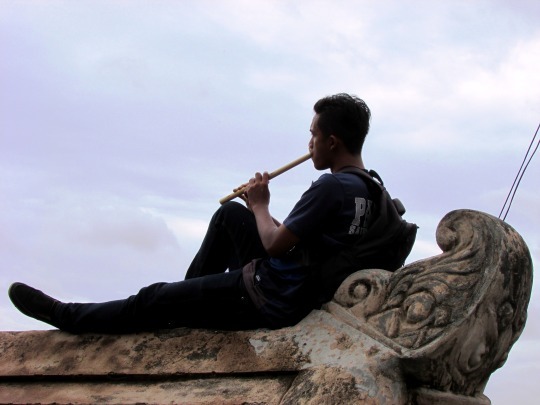 Children play, musicians sing, and couples pose for wedding photographs in the echoing halls that belong to the same complex where the king’s concubines once bathed. The ruins are sprinkled along a fairly large part of the city. One portion of it has been restored, and requires an entrance fee (I shamelessly ignored this part), but much of it is simply tucked in between homes and businesses. The purpose of some of the ruins is not fully understood, but there is an underground mosque that I now consider one of the most interesting pieces of architecture I have ever come across. We went to the Water Castle mostly on an impulse, but I could not be more glad that we did. If there was one part of being in Yogyakarta I really, truly enjoyed, it was the overwhelming presence of batik. Batik is a fabric-dying method which originated on Java; in fact, the word batik comes from Javanese, and literally means “painted.” The beautiful colors and patterns are made by tracing wax onto the fabric, then submersing the fabric into various dyes, and repeating the process as many times as is needed to create some of the most beautiful patterns I have ever seen. The markets in Yogya were overflowing with batik, and everywhere I saw cloth hanging out to dry, already gorgeous in its unfinished state. Not too far from Jalan Malioboro was a small batik art shop, where artists employ the traditional fabric dying technique to create masterpieces in both traditional and very modern styles, and which quickly became one of my favorite parts of my visit. 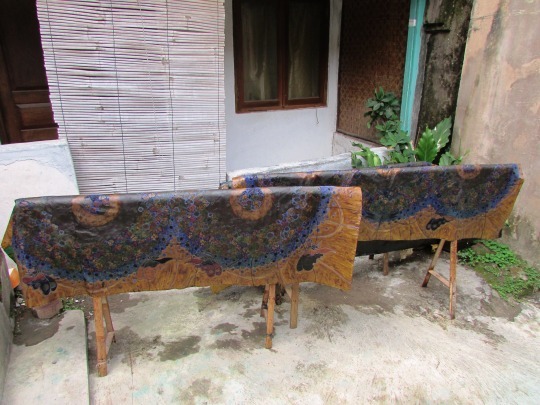 We were able to watch the process of the dying up close, and the friendly manager of the place happily babbled about the different methods various batik artists prefer, and showed us the difference between natural and chemical dyes. 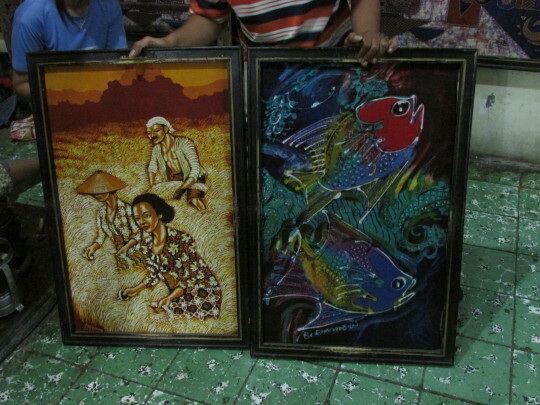 Seeing surrealist-style artwork created by a very traditional dying technique was a perfect representation, in my mind, of the way in which Yogyakarta, and Indonesia as a whole, is constantly trying to balance traditions and modernity, and creating the greatest beauty out of the mess that invariably results. Because I explored Yogya with the help of one of my fellow ETAs, who is currently placed there, I was able to enjoy tiny places off the beaten track, and explore parts of Yogya’s culture which I never would have found, or expected to find, on my own. She knew all the best little cafes and warungs, and introduced me to the incredible but also potentially problematic Yogya reggae scene. The opportunity to see Yogya through the filter of her experiences, having lived and worked there for seven months, rather than through pages of a guidebook, was more than I deserved. With one foot planted firmly in the past, and the other searching for stability in the present, Yogyakarta is dancing its way into the future to a re-mix of Bob Marley and gamelon, with the a sort of grace and energy that is seems only it can. I cannot boast to understand this place, having only visited for a short time, but I cannot but be thankful that I was given the opportunity to pass through.